Fern stitch is a easy quickly worked, stitch that is ideal to use in floral sprays and at Christmas time it is ideal in simple wreaths. 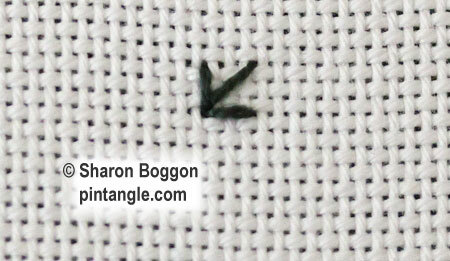 You can also work this stitch in groups of 3 to make a bird foot print. It is ideal to create a trail of prints across a sandy beach scene. 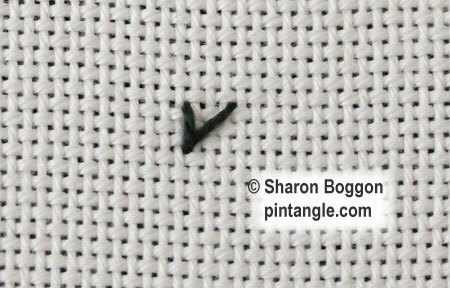 The demonstration of this stitch is worked in cotton perle # 5 thread. 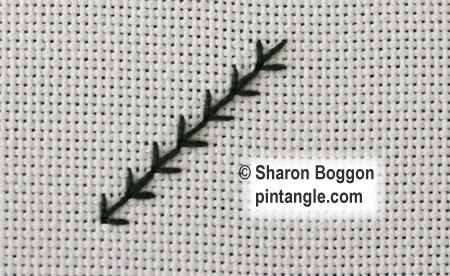 Fern stitch consists of a simple arrangement of 3 straight stitches. 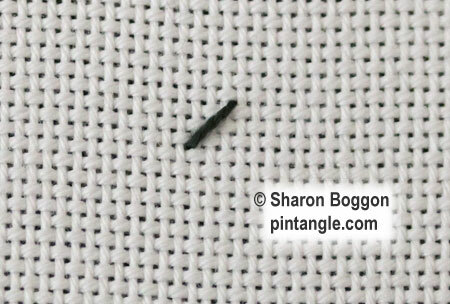 Bring the thread from the back of the fabric and work a straight stitch at an angle. Next work a vertical straight on the left side followed by a vertical straight stitch on the right side. This unit of 3 straight stitches is repeated along the line. You can vary the length of the side spines to create an organic line and by adding french knots or beads to the spiky ‘arms’ of the stitch it can sit even better in a floral spray. If you want to emphasise the central line the spine can be further decorated by whipping the central line with another thread of a different colour or texture. It is a very simple stitch that lends itself to all sorts of applications and can be taught to children. A great little stitch that became philosophical and educational! Here’s my Tast 133 sample. Hi Sharon, this is my first time posting to TAST. Thank you forrthe wonderful information you give us. I am learning so much. I hope this links to my blog. HI Nicky I took the liberty of adding a link to your comment- you just need to copy the web address from the top field in your browser and paste it into your comment here. If it has the http bit in the address it will become a link and people can visit your blog and see what you have done. Hello Sharon, I will enjoy the new stitch and I have a really large smile on my face! Hi Anneliese pleased you are smiling!